Get ready for the show of a lifetime! 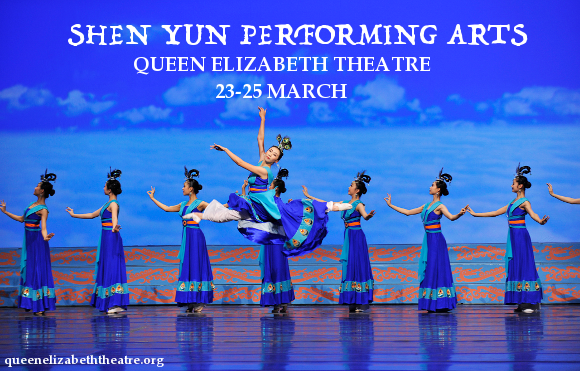 On Sunday 25th March 2018, the incredible Shen Yun Performing Arts company will arrive at the Queen Elizabeth Theatre for a spectacular night of traditional Chinese dance!! A show that audiences from around the world travel to attend, the Shen Yun performance is truly unmissable. Don't miss your chance to be a part of an event that you will never forget! Tickets are in very high demand, so be quick about getting yours! Known as the Land of the Divine in ancient times, the traditional arts and dance of China have been restored to their full glory by the New York based company, the Shen Yun Performing Arts company, formed 2006. Incorporating a mix of Chinese folk dances, legends and stories, the Shen Yun performance is one that cannot be seen anywhere else – not even in China itself! Have you bought those tickets yet? Hurry for your chance to get the best seats! !